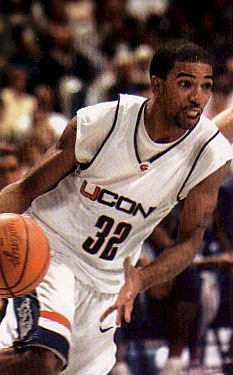 Richard “RIP” Hamilton was a Guard for the UConn Huskies from 1996 – 1999. He was the Most Valuable Player of the 1999 National Collegiate Athletic Association Final Four when UConn won its first National Championship. In three years at UConn, RIP enjoyed many honors, among them were reaching his 1,000th point in only 55 games—the fastest in UConn history—and finishing second in UConn career scoring with 2,036 points. 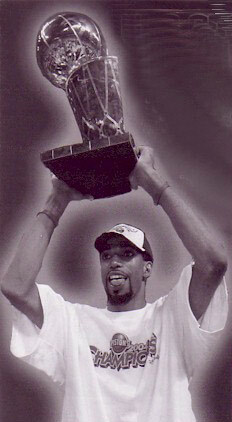 I had the pleasure of talking to RIP in January 2006 about his basketball accomplishments, memories, and future goals. Once he arrived at UConn he felt the transition from high school to college was rather difficult. RIP had never been away from Coatesville. Prior to his recruiting visits, he hadn’t ever flown on a plane. Now in Storrs, on his own, he had to adjust. RIP’s most memorable game at UConn was during his freshman year, a game against Kansas, the #1 team in the country at the time. “I think I had 18 points in the first half, and we were up by about 10 points. We ended up loosing by one or two points but that game set the tone for us freshman—Kevin Freeman, Jake Voskuhl, and my college careers.” Among RIP’s many honors, and accomplishments while at the University of Connecticut were being Big East Rookie of the week, named to the Big East All-Rookie Team, Big East Player of the Week, Big East All-Tournament Team twice, Big East Co-Player of the year, Outstanding Player of the NCAA West Regionals, and Most Valuable Player of the Final Four. The transition from college to the NBA was a little easier than from high school to college. Coach Calhoun had provided good training both on and off the court. RIP’s experience at UConn taught him how to be a man. Living on his own, constantly being viewed by the fans, the media, and six dozen beat writers. At the NBA level it’s more, but of the same—fans and media from across the country—but RIP was already experienced so the transition was not that difficult. At the beginning of the 2002 NBA season, RIP was traded to the Detroit Pistons-currently the best team in the NBA with a great combination of players. RIP continues to enjoy his accomplishments in the NBA. In 2004 the Pistons won the NBA Championship, making RIP the only former UConn player to receive the greatest honor in college, and in the NBA. Earlier this week RIP was named to the 2006 NBA All Star Team. His other accomplishments in the NBA include Player of the week 1/16/2006, in 2005 he became the fifth player in the Detroit Piston franchise to score over 1,000 post season points, and he was ranked ninth among NBA two guards in scoring, and third in assists in 2005. When asked what a day is like in the life of RIP he responded, “Its fun. I’m still the same guy. I still have the people from Coatesville around me that I grew up with. I’m blessed that I have the opportunity to take care of my family, myself, and do everything that I ever imagined or dreamed of.” Having accomplished so much at such a young age RIP’s future goals are to try to win another NBA Championship, try to make the NBA All Star Team (at the time of this interview it had not been announced yet, that RIP made the 2006 All Star Team), and try to keep on doing everything positive, not being satisfied with being satisfied. RIP doesn’t get to attend many UConn games because of conflicts with his NBA schedule but he stays up to date on what the team is doing, and brags about UConn every day in the locker room. Regarding UConn’s chances of getting to this years Final Four, RIP says, “They’ve got a great chance. As long as they stay committed to winning, and listening to Coach Calhoun, and they play with 110% effort.” If UConn is at the Final Four, RIP will be there to watch. RIP’s family; mother, father, two younger sisters, and one younger brother have followed RIP’s career traveling from Pennsylvania to Connecticut to see almost all of his UConn games, and continue to see as many of his NBA games as possible.